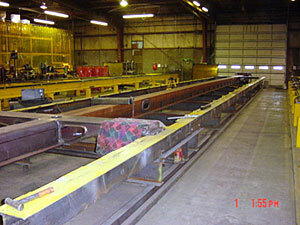 All photos in this article were taken by Dan Barker during a public tour of the Colorado Railcar plant in Feb., 2003. It's a common misconception that most ultradomes are built out of former SP and CNW bilevel commuter cars. While this was true of the first four cars, and partially true of the next two, all of the cars built since that time have been built from scratch. 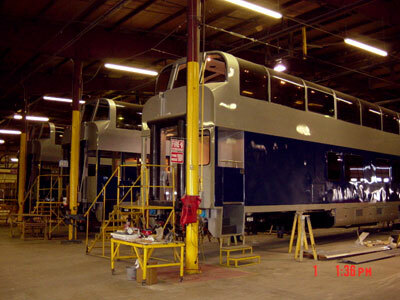 According to Tom Janaky, VP of Marketing and Sales for Colorado Railcar, the progression went something like this: the first four cars were built by literally taking the tops off of four ex-SP Pullman bilevel cars, raising the floor and putting new tops on with the dome glass frames. While this method was a great way of proving the concept, it was quite time intensive, and the doors in the middle were a bit limiting to the versatility of the floor plan. For the next two cars ordered, the host cars were stripped all the way down to the center sills and rebuilt with fabricated sides and ends. While this saved a bit on the labor costs, it was only a natural progression to completely fabricate the car from scratch. Today's ultradomes are built using a set of custom jigs in order to speed the process. First, a center sill is layed up, followed by the sides, which are layed up on two more jigs positioned on either side of the center sill. When completed, the sides are lifted into position and joined to the center sill, and a fabricated dome frame is placed on the top. 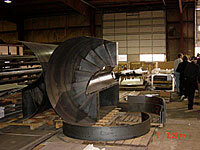 The center sill jig is shown in the above photo with the frame of what is probably to become Rocky Mountianeer 9521, taken during a public open house in Feb., 2003. All in all, metal work on the cars is said to take about two weeks, meaning that the next eight and a half months is spent entirely on finish work. Trucks are rebuilt, miles of electrical cable and conduit are strung, and the actual structure of the car is fleshed out and put together. 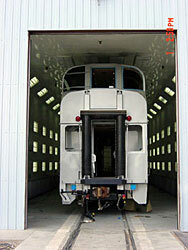 During the process, the car is painted in a modern paint booth located just outside the main shop area. After being painted, and having the interior completed and decorated, the car is completely cleaned and prepared for delivery. The ultradome design is unique in that most all of the heavy components of the car are slung underneath the center sill, leaving the bottom floor completely open for revenue use. Generator, air conditioner condensers, water and fuel storage are all located under the car. Besides the space savings, this has the obvious advantage of placing all the weight lower, making the car ride better and more stable. In addition to the patents on overall design, Colorado Railcar also builds in several more subtle features. One of the most innovative is the ducted air conditioning system, which is designed to help adequately circulate the air around the upper level to help prevent the window fogging that is common on full dome cars.